Serena met me at the station ecstatic to see me :) She is the sweetest! She helped carry my oversized luggage to her precious little old van/car that she had just recently learned how to drive. All loaded in, we were off to run some errands and make some visits before returning home to pack for our weekend in the alps! Serena was moving to Galway for work 2 days after New Year's, so our pre adventure errands included packing up and also making visits to her Nonni since she wouldn't seem them prior to leaving for Galway. 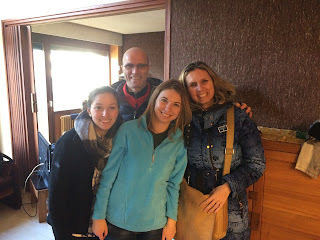 We putted around Torino in Serena's little van-car, making our first stop at the Sicilian nonni who I stayed with years ago in Mazara del Vallo. What stuck in my mind from that visit in Sicily was the gamberoni and other delicious seafood treats cooked with love by her Nonna, holding on tight as her Nonno drove us around in his little car beeping at everything in sight, and how could I forget the chocolate doughy pillows of the BOMBOLONE!? It was lovely to see them again even just for a short while. But what was even better was going with her to see her Nonno on her mother's side who I hadn't met before, or if I had, it was a long long time ago. I had the best evening chatting with Serena, her Nonno and Carla (her Nonno's wife). Carla was the sweetest lady, whose cooking skills were unbelievable. She made a delicious multi-course meal for us, pasta, meat, vegetables, and then we rounded out the meal with a little dopo cena liquore insisted by her Nonno. As the head of the house and table, Serena's nonno reminded me how much I missed my nonno, and I knew how tough it was going to be for her to leave him for Galway. Back at Serena's apartment we organized, packed and chatted. The plan was for the crew to meet at her place before 9:00am and to be on the road towards Chamonix by 9:00. I was pleasantly surprised that we actually stuck to that plan! We had clothes, ski gear, and food for 3 days to pack among two cars... rather, two Italian cars. We managed to pack everything up and we were on the (short) road to Chamonix. I co-piloted Diego's car with Maddalena in the back, my two new friends :) And Serena drove up with Andrea and his friend Marco. With a quick stop at an Autogrill to use the bathroom and to get one of my top five cappuccinos ever, we were quickly paying the toll to enter the Mont Blanc tunnel on our way into France! Driving through the Valle d'Aosta was fabulous. It was fun seeing the landscape change from the city of Torino with the mountains framing the horizon, towards the base of those very mountains in just two hours time. Architecture changed as well. A-framed houses sprinkled the hills between fields and small towns stuck into the mountainside. Driving through the Mont Blanc tunnel was also a treat! What a L O N G tunnel! At nearly 10 miles long, we were underground for what seemed like at least 20 minutes, then just like that, we were on the French side in the base of the French alps! Cristina's apartment sat at the base of Le Brevent, about 20 meters away from the gondola to take you up. Part of a larger A-frame building, all of the rooms looked directly out at the mountain through large windows. 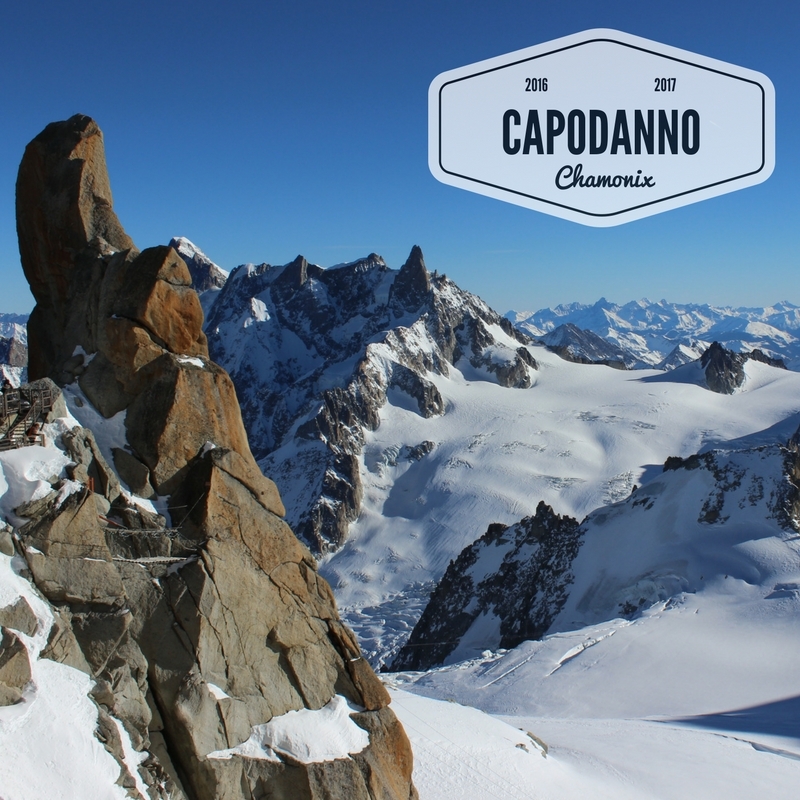 It was the perfect ski chalet set in the perfect location, we were set up well to have a lovely new years in Chamonix, the only thing was, it was looking like there wasn't going to be much snow to ski! We got our stuff settled then headed out toward the town with Gaetano and Cristina to grab some lunch. We ate outside in the main square of town, we enjoyed a delicious beer and a croque monsieur with the drastic backdrop of the French alps winking at us with every bite and sip. We strolled the town and the little Christmas stalls remaining from the holiday then returned to the house to prep to go do our grocery shopping for the next couple of days. Mission Carrefour was an interesting one! 3 men, 3 women, walk into a Carrefour without a grocery list, task at hand: 3 days of snacks, 3 days of drinks, 2 days of lunches and a new year's eve feast! Oh, p.s. don't forget the cotechino! An hour or so later, cart full, we head towards the check out, unsure we had actual meals planned out well, but rather certain we had plenty to eat and drink for 3 days! That evening we put away all the groceries we had just bought, then set out on foot towards the town center to find some oysters for dinner! 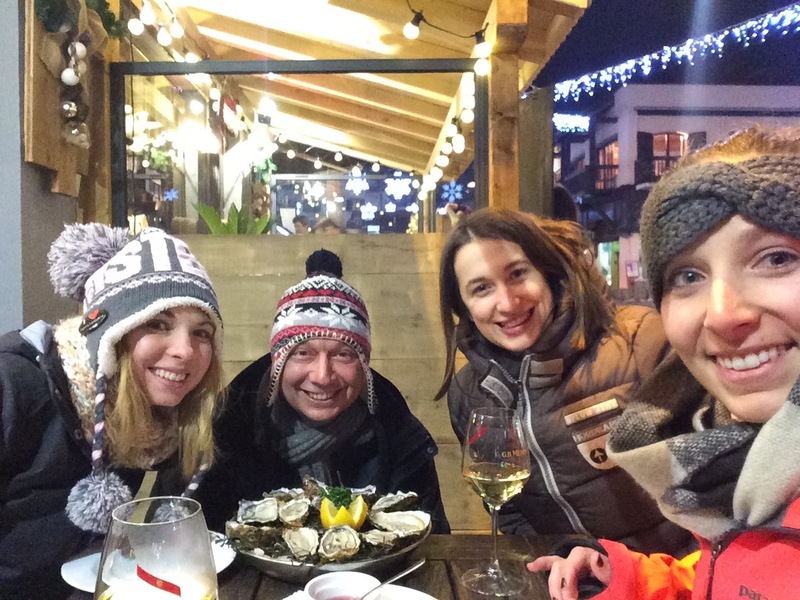 Who knew oysters were a thing in the french alps!? In any case, we weren't quite hungry since we had a late lunch, so we went to find an oyster bar for dinner and some accompanying champagne. We did the typical european thing, bundled up and sat outside freezing our butts off, but man was it fun! After oysters, we made our way to another outdoor bar and sipped on some mulled wine to warm us up, then we called it a night! 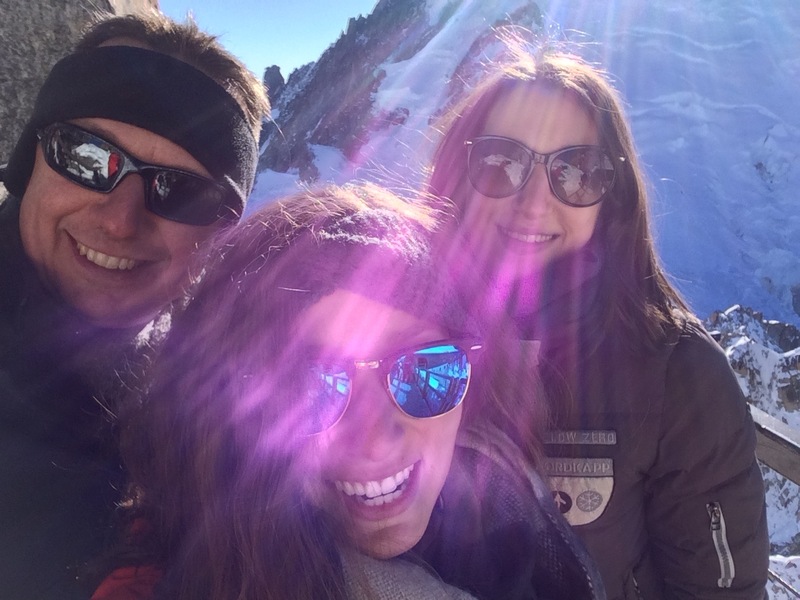 Our first full day in Chamonix, we packed our sandwiches, grabbed our skis and went in search of some fresh powder! However, the powder was not found, nor was it there. 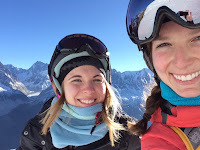 But we still had a lovely sunny day skiing in the French alps! Even just the gondola ride from the parking lot up to the lodge was worth the ski pass. We were spoiled with stunning views of Mont Blanc and the surrounding mountains being hit with a heavenly sunshine. Although there was not much snow to take advantage of, the weather was perfect, the sun was bright, and the sky was blue blue blue. We did a couple of runs, enjoyed the view, navigated the terrain then decided to find a sunny bench to enjoy lunch. We stripped some layers basking in the warm sun during lunch. We just soaked up the views and each other's company and leisurely got back out on the slopes until the last gondola ride down. That evening we went out to have our typical French Alps meal at Le Monchu. Entering Le Monchu we were smacked in the face with a wall of hot, smokey, cheese smelling air. 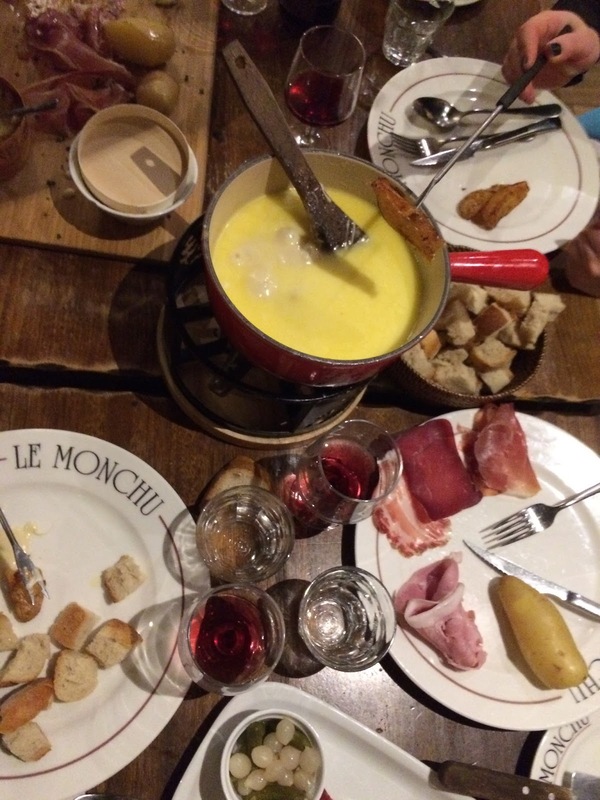 The name of that game: FONDUE & RACLETTE! Besides getting nearly smoked and sweat out of my corner seat of the table due to close proximity to the Raclette flames, I had a lovely time enjoying a fancy extra cheesy dinner and chatting in Italian with my new friends! Tired from a long day of skiing and aware the next evening would be a late one, we called it a night after dinner and went to go veg out in the funky Chamonix house! Full Day 2 - As Serena and Andrea were brave enough to try skiing again on the peak at the base of our house, the rest of the crew ventured out to L'Aiguille du Midi, the tallest peak of Mont Blanc. We took the funicular up from the town of Chamonix and it was just spectacular. Again, another beautiful sunny and blue skies kind of day. The mountains seemed to go on forever, and looking at the various peaks and views into France and into Italy were just amazing. What was even more amazing was that a couple on the gondola had their ski gear packed, so I inquired what their intent was once they got to the top. "Ya know, we just plan to ski down into Italy somewhere and hopefully grab a pizza!" Once we were at the top, we saw them take their gear, and start hiking out a steep looking ridge... pazzi! But it actually looked like they wouldn't be the first ones to make tracks down the mountain that day! So many pazzi! We spent time exploring the structure at the top, following the different paths to different views, checking out the museum and staring in awe at rock climbers climbing up the rock face of Mont Blanc. Truly incredible. 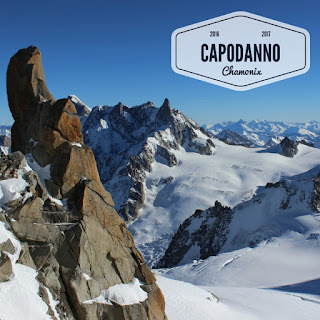 We had lunch in the cafeteria with a perfect view, enjoyed a Mont Blanc brew, then descended back to Chamonix in time to prepare for the grande cena di capodanno. What a day! The real fun came at dinner time. Orchestrated by Marco in the kitchen, help from some tiny cute beers and the whole crew, saved by Andrea Senor bringing the Cotechino and eaten by us all, we endured in a couple hours of fun and entertaining prep work to make the perfect New Years Eve dinner. Marco organized everything from start to finish, ordering us around the 3 foot tiny kitchen, by 9pm we had a large meal ready to go from antipasti, primi, secondi, contorni and dolci, it was BIG. Much to the group's dismay, I forced us to watch the RAI New Year's Eve spectacular since I had never witnessed it before. After the new year was rung it, it was clear why the group had preferred to watch Aladdin that was on another channel instead of the RAI NYE broadcast - it was quite a terrible performance in Matera, but beyond typical Italian so I honestly thoroughly enjoyed watching it. We had Italian jokes and fun while we filled our stomachs to the brim and rung in the new year with friendly kisses around! 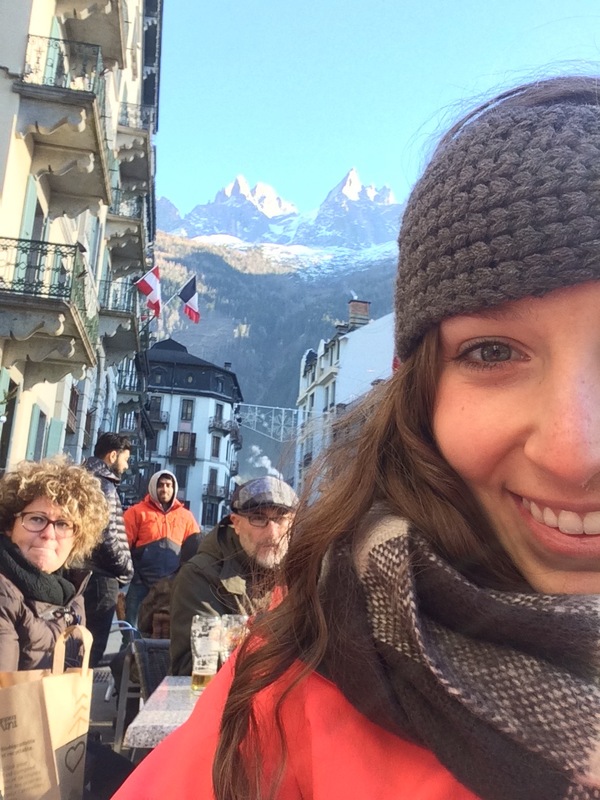 Stomachs full, we rallied with some espresso, bundled up then headed out to dance the new year in in Chamonix.